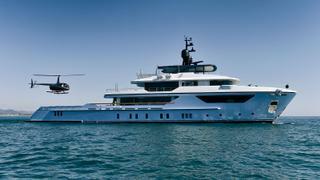 The success of Sanlorenzo’s explorer yachts line has seen it expand, with the new 47 metre 500 EXP offering owners even more space and power – and helicopter capability – to aid their explorations of the globe. 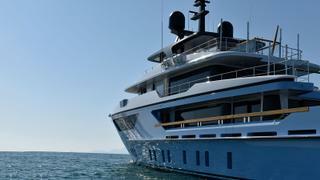 While the style of the successful 460 EXP has remained, the yacht has been lengthened by more than four metres. Even with a maximum beam of 9.6 metres, it still manages to remain under the 500GT threshold, allowing for simpler management. 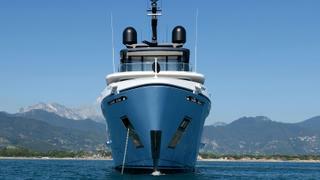 Exceptionally in a yacht of this size, the 500 EXP features a helipad on the main deck aft – a key sign of a true explorer. It is set up for touch-and-go operations, allowing you to fly guests in and out or join ship just about anywhere in the world. The visual cues for landing are inlaid into the deck, made of specialised resin, and, when not in use for the chopper, this area can be used for storing the main tender of up to nine metres, plus a sailing dinghy, submersible or other toy. The five tonne crane stows away automatically below the deck to create an uncluttered space with perfect lines, so at anchor this could be a solarium or a performance space for outdoor movies or dancing. 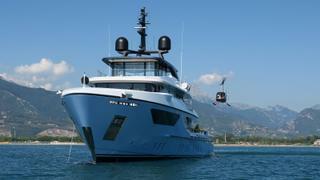 Exceptionally in a yacht of this size, the 500 EXP features a helipad on the main deck aft – a key sign of a true explorer. It is set up for touch-and-go operations, allowing you to fly guests in and out or join ship just about anywhere in the world. 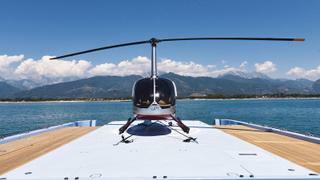 The visual cues for landing are inlaid into the deck, made of specialised resin, and, when not in use for the chopper, this area can be used for storing the main tender of up to nine metres, plus a sailing dinghy, submersible or other toy. The five tonne crane stows away automatically below the deck to create an uncluttered space with perfect lines, so at anchor this could be a solarium or a performance space for outdoor movies or dancing. Sanlorenzo has created a luxurious beach club far larger than might be expected on a yacht of this LOA, thanks to clever use of the opening transom and a shell door to starboard. When at anchor, this important area of the boat becomes a huge terrace on the sea with easy access to the water for guests’ enjoyment. There’s the option of a gym and a hammam or steam room in this space, which can also be used for storing toys when under way. The 500 EXP is all about exploring far-flung places, so the design team spent a lot of time and effort utilising every available space on board. The often dead area below the lower deck houses the custom made cold and dry storage units, offering a total of eight cubic metres (4 and 4) of food stores. Access is via a convenient corridor connecting to the crew area and galley above. It’s enough to supply guests with fine, fresh cuisine for weeks at a time. Powered by CAT C32 Acert or MTU 8V 4000 M63, the 500 EXP can reach a top speed of 16 knots and, thanks to her 60,000 litre fuel tanks, has a range of 4,500nm at 11 knots. The 500 EXP is all about exploring far-flung places, so the design team spent a lot of time and effort utilising every available space on board. The often dead area below the lower deck houses the custom made cold and dry storage units, offering a total of eight cubic metres (4 and 4) of food stores. Access is via a convenient corridor connecting to the crew area and galley above. It’s enough to supply guests with fine, fresh cuisine for weeks at a time. Powered by CAT C32 Acert or MTU 8V 4000 M63, the 500 EXP can reach a top speed of 16 knots and, thanks to her 60,000 litre fuel tanks, has a range of 4,500nm at 11 knots. Crossing oceans to visit the world’s remotest locations, or simply cruising the Med, your onboard toys can turn a great experience into an unforgettable one. Sanlorenzo knows this and has worked hard to keep the bow of the 500 EXP open to accommodate tenders and toys of more than three metres. In total, some 24 square metres are available here, to park personal watercraft, small tenders and more, while a dedicated davit makes launching them easy. 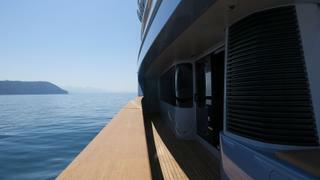 And it is all tucked smartly out of view of guests behind the deep wave-piercing bow. The saloon and dining area on the main deck is generous enough, but can be extended into an al fresco space at the touch of a button. Sanlorenzo has perfected the engineering behind sliding doors, with the option to open up three walls of the saloon to fresh air and the sound of the sea. Here 10 people can eat in relaxed comfort or high style, as desired, then retire to the deep upholstery of the custom-built sofas and armchairs aft. Indirect lighting and high-end AV make this a hugely relaxing area.